Eneida Gutierrez, “Grammie” to all who met her, was born February 6, 1929 in Los Angeles, California. 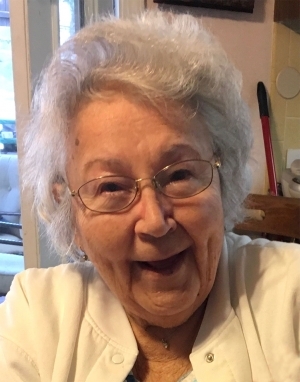 She passed away October 12, 2018 at Treacy Villa in Ventura, California at the age of 89. She was a resident of Ventura County for 40 years. She held many jobs throughout her life, but none as important as being a loving wife, Mom and “Grammie” to those she loved. She loved camping in Yosemite, traveling and all things pertaining to flowers. She was preceded in death by her husband of 69 years, Carlos “Papa” Gutierrez, and her son-in-law, Terry Rosenblad. She is survived by her sister, Ileana (Lee) Day, daughter Shelly Rosenblad of Fillmore, California, son Mike Gutierrez (spouse Stella) of Palmdale, California, daughter Cindy (spouse Tom) of Eagle Point, Oregon, son Greg Gutierrez of Palmdale, California, and son Steve Gutierrez (spouse Barb) of Palmdale, California, 15 grandchildren and 22 great-grandchildren. A funeral Mass will be held at 12 noon on Friday, October 26 at St. Francis of Assisi Catholic Church in Fillmore, with final internment immediately following at Bardsdale Cemetery, 1698 S. Sespe St., Fillmore. Funeral services are under the direction of Skillin-Carroll Funeral Home, 600 Central Ave., Fillmore, California.